Lang 26 Blade Offset Feeler Gauge 4'' Long is equipped with knurled lock-nut, which releases the blades instantly for rapid selection of size desired and when tightened locks the individual blade into the working position, retaining the blades not in use firmly in the handle. 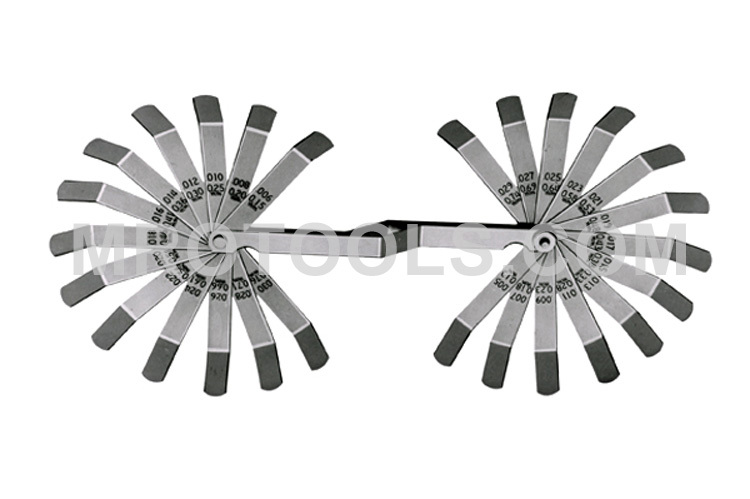 Lang Offset Feeler Gauge Blades have 1'' 45° offset for checking valve clearances. The sizes are permanently etched on each blade. Lang 12 Blade Offset Feeler Gauge 4'' Long. Contains: Twelve - 4'' x 1/2'' blades with thicknesses .008 - .026. Lang 16 Offset Blade Tappet Feeler Gauge 4'' Long. Contains: Sixteen - 4'' x 1/2'' blades with thicknesses .005 - .020. Lang Offset Valve Tappet Gauge Set - Imports. Contains: Eleven - 3'' x 1/2'' blades with thicknesses .004/.102mm - .014/.356mm. Lang Replacement Blades For 3085. Contains: Eleven - 3'' x 1/2'' blades with thicknesses .004/.102mm -.014/.356mm. The 3275A Lang 26 Blade Offset Feeler Gauge 4'' Long is one of thousands of quality tooling products available from MRO Tools. Please browse Lang Offset Gauges for tools similar to the 3275A Lang 26 Blade Offset Feeler Gauge 4'' Long. 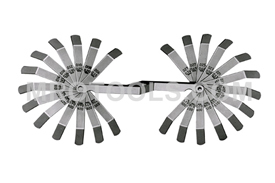 3275A Lang 26 Blade Offset Feeler Gauge 4'' Long description summary: Lang 26 Blade Offset Feeler Gauge 4'' Long. Contains: Twenty-six - 4'' x 1/2'' with thicknesses .005 - .030. Quantity discounts may be available for the 3275A Lang 26 Blade Offset Feeler Gauge 4'' Long. Please contact MRO Tools for details.